It was fitting that last week, in the run up to the Rugby Union World Cup final in New Zealand, I found myself thinking about the sport’s early days. On Wednesday, I was at the University of Westminster’s fantastic archive for some biographical research I’m doing on members of the Polytechnic Harriers – I’ll blog about that in the future. On my way back to Waterloo, I walked past a plaque on the wall of the Texas Embassy, a restaurant near Trafalgar Square. 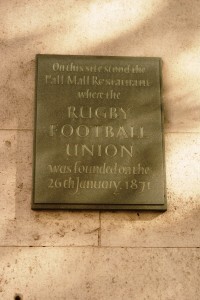 The plaque – easily missed on this busy road – commemorates the founding meeting of the Rugby Football Union, which took place at the Pall Mall Restaurant in January 1871. The restaurant is long gone, demolished in the 1920s, but the site is still important. It was here that representatives of 21 football clubs who wanted to play their football in the Rugby School style met to form their own association. These clubs, including Guy’s Hospital, Blackheath, Civil Service, Mohicans, and the Wimbledon Hornets, had fallen out with the Football Association, formed in 1863, over their preference for the Rugby game. At the Pall Mall Restaurant, they established a new collective body, which they called the Rugby Football Union, and they started work on a set of laws for all clubs wishing to play the Rugby way. The plaque thus commemorates the birth of a governing body, one which helped to make the Rugby code popular throughout Britain and the Empire. It is far more meaningful as a marker of origins than the fairy tale statue of William Webb Ellis at Rugby School itself. The next day, I used a document from the early days of the RFU in my sports history class at the University of Southampton. Trojans, Southampton’s foremost Rugby Union club, have preserved the minute book from their foundation in 1874, and have put extracts from it their website. My students and I explored this evocative manuscript for the light it could shed on the sport. For a start, the word ‘Rugby’ was not used anywhere in the minutes from their first meeting at the Antelope Hotel. The founding members knew what they meant by ‘football’, and didn’t need to write it down. Next, the text captures the Victorian middle class concern for rules and protocols, with their clear instructions on subscriptions, election methods (complete with the black balling of undesirables), committee structures and quorums. Most intriguing, though, was the new club’s Bye Law 7: “That no Bye Law or Law of the game shall be altered, rescinded or adding to [sic], without the consent of at least two-thirds of those present at a General Meeting.” Here is a club reserving the right to change the laws of the game, albeit through proper constitutional channels. The Pall Mall plaque tells the story of a bureaucratic birth. The Trojans’ minute book adds to the story by giving us a feel for how clubs emerged from the grassroots in towns and cities across the country, and how the game was still fluid in its early years. Taken together, these two artefacts remind us that no sport is ever born fully-formed. Evolution and experimentation carry on, even after the creation of a governing body.